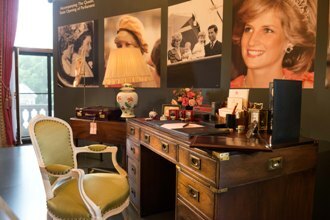 The centrepiece of the display is the desk at which The Princess worked in her sitting room at Kensington Palace, writing letters and reading official briefings and correspondence. Many of the objects shown on and around her desk have been selected by The Duke of Cambridge and Prince Harry to reflect their mother's commitment to duty and their personal memories of her. Diana, Princess of Wales always wrote to thank those who had welcomed her on official visits, and the blotter and letter rack were part of The Princess's desk accessories. The letter rack contains her cypher-embossed writing paper and envelopes. The briefcase, made by Asprey, was a gift from the Worshipful Company of Glovers to Lady Diana Spencer on the occasion of her marriage in 1981. These small boxes were commissioned as gifts from Halcyon Days of London for The Princess to give to her hosts on official trips overseas. Among those displayed is one from the official visit to Brazil by The Prince and Princess of Wales in April 1991. It is decorated with an image of the statue of Christ the Redeemer which dominates the skyline of Rio de Janeiro, surmounted by The Prince of Wales's feathers. Diana, Princess of Wales loved dance in all its forms, but particularly ballet. These shoes, which she used, were hung on the door of her sitting room at Kensington Palace. The Princess loved music and constantly listened to the radio, records and tapes when working at her desk. Among the tapes in the case are albums by Diana Ross, Elton John and George Michael, as well as works from the classical repertoire of opera and piano concerti. The Summer Opening of the State Rooms at Buckingham Palace, including the special exhibition Royal Gifts and the tribute to Diana, Princess of Wales, is from 22 July to 1 October 2017.